1. Having April O’Neil for an aunt still impresses boys. 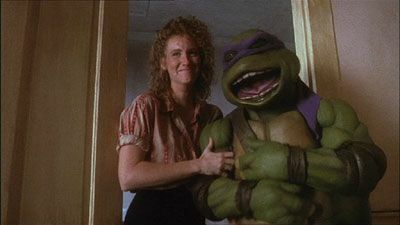 My aunt played April O’Neil in the 1990 Teenage Mutant Ninja Turtles feature film. I shamelessly used this fact to impress boys in elementary school, but I really thought I didn’t have any mileage left with this one and only family connection to Hollywood. Turns out I was wrong. April, also known as Judith Hoag, with Donatello. Sheardrum Farm is located down a very long driveway so on the night I arrived I agreed to meet Ali in a small town a few miles from the farm so I wouldn’t get lost in the dark. I was told to look for a muddy, white Land Rover and I told Ali I would have a brown bike with bright red panniers. I was waiting at the main intersection in town where there is a small fish and chips/ice cream place called Dario. The whole street Dario is on smells like one big french fry and if you’re hungry it’s hard to resist. I knew I had about 15 minutes before Ali was going to arrive and, as usual, I was hungry. I decided to get some onion rings. I waited in line for a few minutes while a group of little boys finished up their Dario transaction which involved a lot of coin counting, addition, subtraction, credit assessment, and loans between one another. I finally placed my order and I went back outside to sit on the crossbar of my loaded up bike while I waited for my greasy indulgence to come out of the bubbling fryers. The boys had moved outside too and I watched them greedily dig into their ice cream, burgers, and fish and chips. I could tell they were on the precipice of becoming teenagers, and probably eager to grow up, but they still looked like children for now. They didn’t have acne, gangly arms, or any of the other markings of adolescence yet. They were eyeing me and my bike and then one of them—the alpha of the group—finally said slightly playfully, “that’s a nice bike ya got.” I smiled and said thank you and then the whole pack was emboldened. They were intrigued by my accent. Introductions ensued and then I was hit with a barrage of questions. Should cyclists be eating onion rings? Do you have a six pack? How old are you? Do you have a boyfriend? Have you ever smoked a cigarette? Why are you in Scotland? What kind of music do you listen to? Have you ever met a movie star? This is where April O’Neil came in handy. I thought they would be too young, but they knew about Teenage Mutant Ninja Turtles and they were impressed. They also were impressed when I told them I’d seen Cameron Diaz in the LA airport once. They didn’t know what I meant by LA though, so I just said it was the Hollywood airport. These little fellows were adorable—and concerned that I was alone. I reassured them that my friend was coming to meet me in just a few minutes, but the alpha of the group decided I would not be left unaccompanied. “Don’t worry, Christine. We’ll wait with you,” he said confidently and then the others began to nod and echo his offer. One of the boys actually called home to let his “mum” know that they’d met an American girl who’d cycled here from London and that he was going to be late because they wanted to make sure I found my friend safely. Part of me wanted to remind the boys that I’d been traveling alone for months and would be fine waiting another five or ten minutes alone, but I was enjoying talking to them and they clearly felt that keeping me company was their gentlemanly duty. This quiet Scottish village was a welcome change of scenery from the rough towns of middle England I’d biked through where kids seemed hardened and suspicious. They erupted with cheers and then each of them gave me a high five. Scotland has an inferiority-complex with England. Scottish people love to bash England, but most English people are pretty disinterested in Scotland. Apparently the English are too busy trying to take the French down a notch. 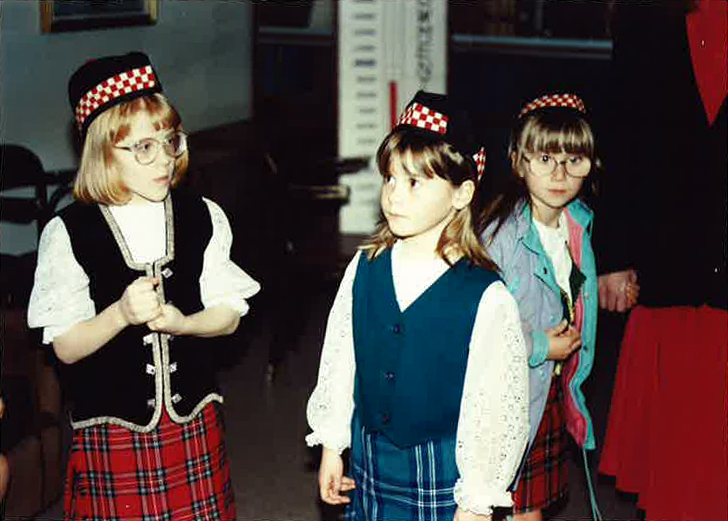 Anyway, these little Scots were tickled that I liked Scotland more than England. 2. No one in Scotland dresses like this. 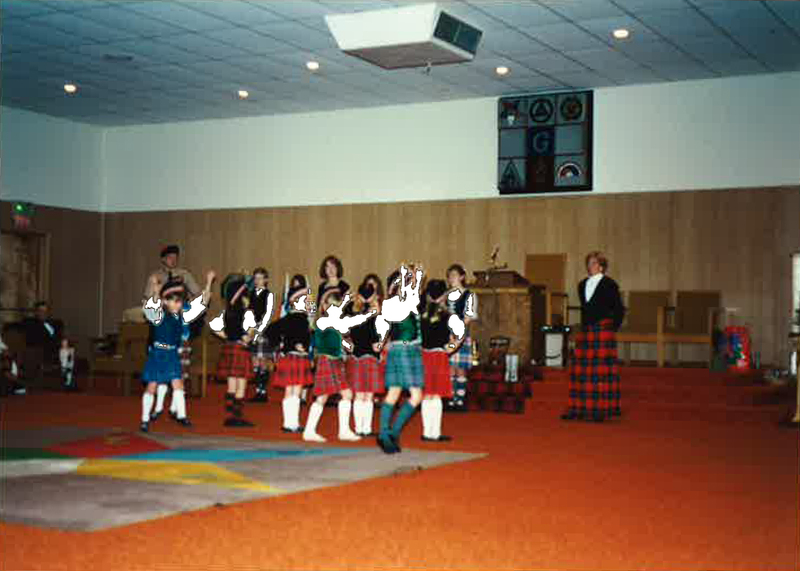 Me at a Scottish dancing competition in Seattle (c. 1992). 3. The Loch Ness monster does not exist. …at least according to Phil Clarke, a transportation planner for Fife Council. Ali and Clare are good friends with Phil and he’s come over for dinner twice since I’ve been here to talk about the work he does designing cycle tracks, promoting cycling, and trying to get more funding for cycle projects in Scotland. One night we also had a heated debate about the Loch Ness Monster. Clare, Ali, and I believe Old Nessie exists and Phil is a non-believer. Phil says that Nessie has been folklore for too long to actually exist. You know a debate is serious when you have to run to the computer, in the middle of dinner, to Google for information that might bolster your argument. It turns out the first Nessie sighting was in 500 A.D.—so she is in fact a very old girl. One thing all three of them agreed on was that I shouldn’t bother visiting Loch Ness while I’m in Scotland. They explained that it isn’t a very picturesque place, the water is murky, and most tourists who go on monster-watching boat tours come back disappointed. 4. There are real jobs in the UK cycling industry now. Phil was trained as a civil engineer, but he always loved cycling. He just never thought he could get a “real” job doing anything related to cycling. He started volunteering for Sustrans over ten years ago back when it was just an organization of bike enthusiasts who tried to build bike paths on the weekends and in their spare time. I complained to him a little bit about my ride north from London and the sections of the Sustrans route that were unmarked, but talking to him put things in perspective. I covered hundreds of miles on safe bike routes. There were stretches of my ride where I lost the route or where the route wasn’t complete—and that was unpleasant—but the UK has a huge network of cycle paths now. Sustrans went from being a little non-profit, to an organization that receives over 40 million pounds a year in public and private funds to build and maintain the national cycle routs. No, the UK isn’t Holland yet. Nor is it Switzerland. But, in ten more years the system of routes in the UK could be incredible. Phil is now employed fulltime designing cycle lanes in Fife Council (council=county). He goes to conferences where transportation planners and engineers wear dress pants and ties and talk at length about the design of bike lanes, parking facilities, and signage. Somehow, cycling has become a (more) respected form of transportation and with that has come “real” jobs. Bike use in Britain has quadrupled since the millennium, bike sales are steadily increasing, and Phil is noticing a shift in Fife. Fife is the third biggest council in Scotland and over the past few years Fife residents and politicians have caught on to the cycling Renaissance that is in full swing in London, Cambridge, Oxford, and the rest of Europe. Families are cycling on the weekends together, there are more and more recreational bike races, and people are beginning to commute to work by bike even though it is a largely rural area. Fife Council is also investing in simple marketing campaigns to promote cycling. The campaign focuses on how cycling is fun and can keep you slim. They’re steering clear of any marketing messages related to the environmental benefits of cycling because most people—even self-proclaimed environmentalists—don’t take up cycling because they feel guilty about driving. People start cycling again because that first time they bike down a hill gives them a high, makes them feel like they’re ten-years-old again, and puts a smile on their face whether they feel like smiling or not. Then, all of a sudden, they want to make sure their children don’t grow up without knowing how good it feels to bike to the top of a hill and then back down the other side. People who stick to it for a few months begin to realize that they can get away with eating onion rings from Dario every so often while still maintaining their now slimmer figure (though not necessarily a six-pack figure). These are the real reasons people start biking again, according to Phil. 5. Baling hay is really hard work. 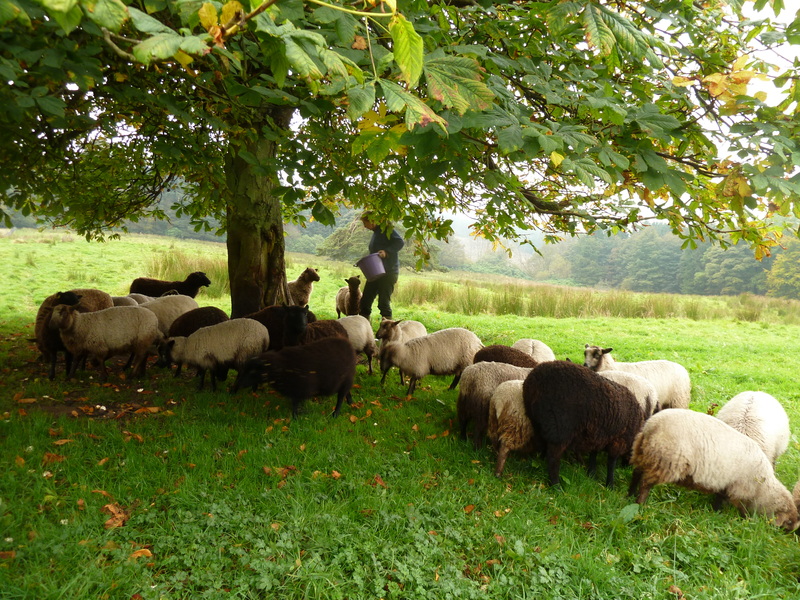 But, the sheep need something to eat during the winter when the grass is covered in snow. 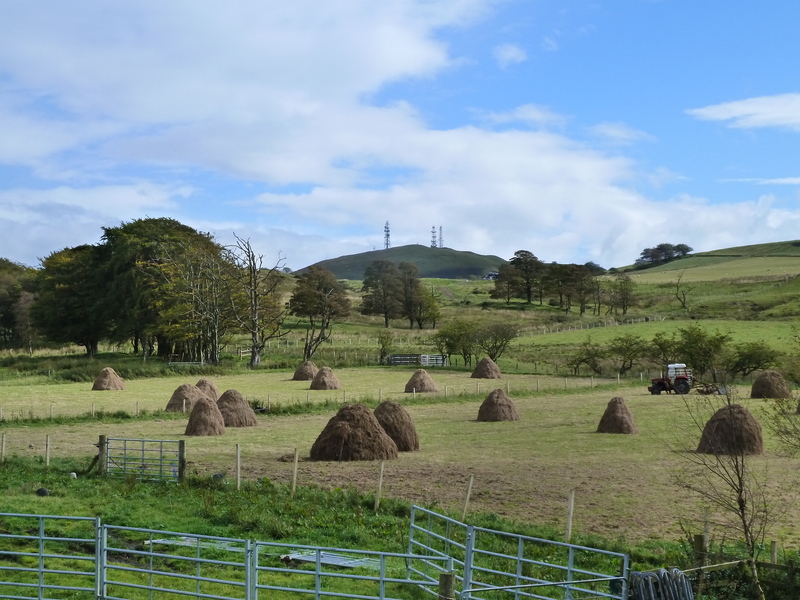 I spent yesterday breaking apart haystacks, feeding hay into a Massey Ferguson hail bailer, throwing the heavy bales into a trailer, and then carrying the bales into the hay loft. I’d sit on top of the bales of hay in the trailer bed while Ali drove the tractor to the hay loft. We worked until the sun went down last night and I felt euphoric, but exhausted, as we were driving across the fields with the last batch of hay. I lay down on the scratchy, sweet-smelling cushions of dry grass. The tractor motor was grumbling loudly and the trailer was bumping along the uneven ground of the field. It had been a hot, clear day and the distant mountains were blue now and the evening sky was pink. I felt so relaxed—like I could fall asleep in the trailer bed of hay—but then I realized we were stopping and heard the tractor motor idling. We’d already made it across the field; I needed to open the gate for Ali. All this green grass will be gone in the winter and they'll need hay. 6. Don’t be afraid to change your itinerary. I hope none of you were planning to meet me in Montreal because Bertha (my bike) and I are taking a slight detour to Japan. On Thursday we’re going to arrive in Tokyo where roughly 20% of all trips are made on bikes. This is an interview with the inventor of the bike umbrella. I have no idea what he’s saying, but I’m now taking orders for Japanese bike umbrellas. Can’t wait to hear about your travels in Japan. Sign me up for a bike umbrella. Those things could really catch on here in Seattle. Make that two. Having just returned from a rainy bike ride, my hair is now a frizzy mess. Could have used a bike umbrella…. Make that three –I want to be the first cyclist on Mercer Island with a bike umbrella! 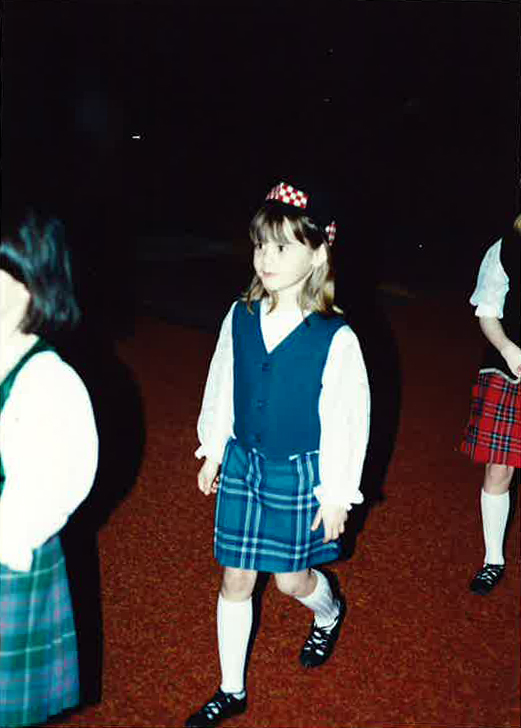 Please know that I am assuming you brushed up on you Scottish dancing skills while in the Land of Scots and am anxiously anticipating a performance upon your return. Have so much fun in Japan! Can’t wait to see pictures!